Outlander is a Capture/Deathmatch map designed for a large amount of players (8-16). This map was originally going to be included in the Warzone2 Package but the SP level was cut due to exuberant wtr (3k and only half built with no textures, yikes!) and I didn't want this map collecting dust. Please note that the screenshot doesn't fully display the ambiance of the skybox and cloudbox. Special thanks to NASA for getting amazing pictures of our solar system. That's the way it it's gonna be for now, can't change until tomorrow. I can't upload today, no access to good internet and I'm not waiting 2 hours for an upload. 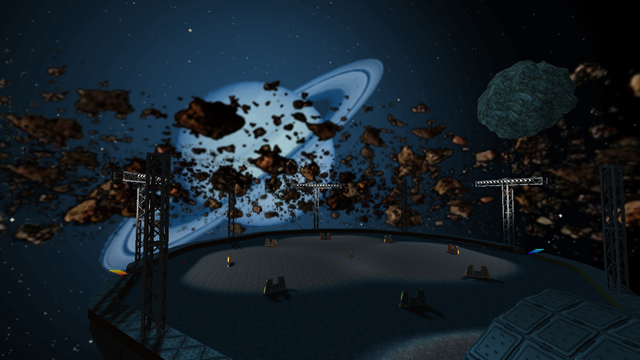 Some of the asteroids rotating in the skybox have black outlines that should probably be removed or at least lessened. The jumppad particle bars look cool. However, on the platform with the ship, it seems like the three ways to leave (2 jumps and a tunnel into the base) shouldn't all be clustered in 90 degrees of the circle. I think the jumppads should be moved further from the tunnel to use the space better. It would look more like the others then, which isn't great (more on that later) but it might lead to bad gameplay at that spot. Having pickups double-stacked on each other is interesting. The arches on the tunnels to the main body of the station look wierd because they don't appear circular, instead coming to an awkward point. sometimes when taking the jumps, you bounce off the asteroids at odd angels and fall to you death, and it's mostly luck. Why are there no capture bases in the middle of the map. It seems weird that there aren't. The gameplay of this map is sort of lacking, because it's just the same flat platforms copy-pasted in four directions. I don't have much to say specifically, because it's just flat and sparse, and not significantly different from most of your other multiplayer maps. You won't hit you head anywhere or any other gameplay things people complain about, so good job with that I guess. The lighting is nothing special, but it gets the job done. Pure white lighting is often frowned upon, but it works fine in shiny outerspace locations. However, it's weird that a planet is the lightsouce, as planets and moons only reflect light from stars, but whatever. The skybox & cloudbox asteroids were as good as I could get them. I tried high-def images, but I couldn't get them to darken without lightening them (best way I can describe it), in addition; when you hold and object over a light source, it creates a shadow around itself (if I could make the cloudbox colour-reactive to the skybox I would). The invisible geometry should house a static model of the floater asteroid (modelname = asteroid, it's under packages/models/asteroid), check the asteroid folder to see if it's there. If it's not, there was a download glitch. There are four ways to leave the platforms, through the tunnel, the jumppads, and over the tunnel (very imaginative, I know). No capture bases in the middle of the map because of the asteroid model in the centre (it's quite big),and because the centre has a lot of cover compared to the other locations. I sky-textured the bottom and top to save wtr. As for getting ontop the centre of the map, I completely forgot to playtest that and I have reposted a newer version so that doesn't happen (also with several minor fixes). I guess the map looks much better with all the models there! the asteroid ambiance is much more pronounced. as to there being 4 exits instead of three, my point about them all being grouped in the same general area still stands, though I shouldn't neglect the second level, because it's the only major height difference in the level. One thing I'll add to what I said earlier is that you die too soon if you fall in the center. there doesn't seem to be any reason you can't jump down to the lower part of the girders holding the asteroid, but if you try it, you die. also, you can walk into the center asteroid on one of the sides. the sky geometry should probably be bumped out a bit there. Fixed packaging issue again, totally forgot about the models/asteroid directory. Okay I've added some crap to the map. I've played around with the jumppads but couldn't get them to shoot you from the far ends of the platforms to the asteroids, so that's the way it's just gonna be. I did however add a catwalk between each tunnel and around the outside of the central building, and a 3rd jumppad in each asteroid to launch you onto the catwalks. Those additions hiked it up to 160k wtr (yikes!). As for the death volume around the asteroid clamps, I don't want people camping down there. I'm not particularly concerned about the skytexture around the central asteroid, as it's very unlikely that someone would consider it a 'good spot to campsnipe' especially on insta, as there's no cover and only your playermodel head is actually inside the mapmodel. I start to consider not to download your content anymore as the packaging keeps being horrifying. People (and I) keep mentioning you should package it differently, yet it seems like you're giving it your own twist. - It is way easier for you to find back your content after a while within your very own Sauerbraten directory. - It is easier for people which download the content to find all related content which requires the map back. - It keeps the Sauerbraten directory less messy as it already is (even with the seperated MyGames directory, it turns out to be a mess after a while as people still just dump their stuff as quick as possible). Why I won't suggest to use the name of the map? - As you might want to use the content on another map also, which makes it look quite odd (and illogical) when downloading the latest map which runs with the elder packaging. - As other people might like to use the content also. Why should they actually have to reference a map which isn't in their packaging? Let them rather reference to the guy who actually packaged the content. The screenshot seems ok, nothing to say about that. Where is actually the license of those skyboxes? There is only a quick reference to NASA but that's a pretty big organization. The texturing could be done better. It's quite plain. The planel2a texture of trak5 has been really overused (seems like there has been relied to much on the trimmings inside the texture). Using the light1a texture of trak5 on a wide spread area looks pretty odd. Using graypanel3 of trak5 on the outside looks really weird and isn't fitting the geometry at all. There hasn't been any textureblending as far as I could see, too bad; what a missed chance. I'm actually quite surprised that the map still consists out of 163k of wtr while a lot of models have been used. My best guess is the trimming which is on top of those long paths takes a lot of wtr (and is textured very choppy?). I've noticed you've set the mdlambient really high (it normally is 30, while you've set it to 125! ), while you probably haven't played with mdlfullbright, neither with mdlglow (which only actually is effective when using a mask, but that's done very easy by specifying the skin once more). The rest of the map has a pretty plain white lighting which feel quite boring. While I often advice mappers to use more models, I would rather advice the opposite this time; use less models. Those asteroids don't need to be models, neither those barricades (why are they on the map anyways?). The asteroids use way too much vertices than necessary and it seems like you haven't used remip before exporting them? Using those capturemeter-particles as lighting or notification of a jumppad is quite original, but too bad; they are rendered 2D. This makes them appear quite odd in a lot of angles (except when you appear from front of course, but that barely happens). Clipping seems one of the best things on the map, not much to say about that. The flow of the map; well there actually is barely. All platforms are on the same height (with 1 top layer on the paths which lead towards the platforms, not a big hit either), while some small barricade is the only thing which provides a little cover on the gigantic areas. It's better to set the jumppads with a strengh that you actually have to push the forward button also to get there, as players tend to press that button 24/7 anyway. It would make it feel odd if you suddenly have to release the forward button to get to a specific area. Of course, you should keep it quite loose so players won't die due lagging or just let the forward button slip. You've ever checked out the map called asteroids? I would advice you to do so as that map provides nearly everything which this map tend to lack. I'm not font of concentrating pickups that close to each other on such wide open map. That just asks for trouble when someone tries to pick any weapons or health up. Seems like you've added enough playerstarts, good job on that. Still quite odd that you've placed playerstarts facing the other direction as a jumppad goes (to the centre of a platform) as another player could just take a ride from a jumppad on the asteroid while you spawned, which means a cheap kill for the opponent while you die once more. You should pay more attention to your layout, spend more time on just 1 project and look around on maps which have already been released. Don't try to invent the wheel another time, invent a way to make it roll better. I'll rate it 4/10 for now. They still are in the packages folder, while not bothering other content (which occurs when everyone just dumps their content in a folder named after their map or content in that particular folder). If it is already clean then you don't need those easier cleanups. That's why I suggest to do it that way as it probably is as clean as it could be. It's not that hard to put it just 1 folder (or in certain cases 2, woohoo) further into the directory. There we probably would find a folder called penguins (seriously? yes, seriously). Then after clicking so, we notice that the folder contains skyboxes which are made by you. So is this actually harder to remove stuff, more time consuming or harder to package? Nah, just 1 or 2 more clicks to do so. The best way of packaging is actually that of Quake 3 (all custom content used within a map is in a zip-file that is located in a base(q3) folder), but as that doesn't seems to work anymore within Sauerbraten as maps aren't packaged in a zip-file (and probably never should), we should keep it this way. Fixed it again (if this packaging isn't correct, then there's no 'correct' way), added more catwalks between platforms and several other mapmodels for cover and ambiance, updated the Vampyres to the new Vampyre MKII, changed the health-to-weapons ratio layout, edited the skybox so the sun looks like a sun, made the central asteroid climbable with quaddamage on it (added a base there too), made the 4 asteroids have 2 more pathways and moved the healthboosts, and the map is now CTF compatible for another test-drive of the pseudo-class system. P.S, before the mapmodels, this map was 450k (the asteroids and towers took up most of that), now it's 158k.